I found this post as I was browsing through travel blogs on my WordPress Reader. It expresses, in the end, what travel can be if you let yourself go—or go with the flow. My wife and I did a bit of this in Venice and wished we had more time. With thanks to Niti. Last September, I went to Venice for a weekend with my roommate from Rome. Countless friends had told me that half the fun of the trip would be getting lost in the city and spending the subsequent hours wandering around. Getting lost? Not having a destination? How can that be fun? I thought to myself. Little did I know that it was exactly what I needed. As a Type A planner by nature, I always needed to know what lay five steps ahead. Then, lo and behold, I encountered this sign. 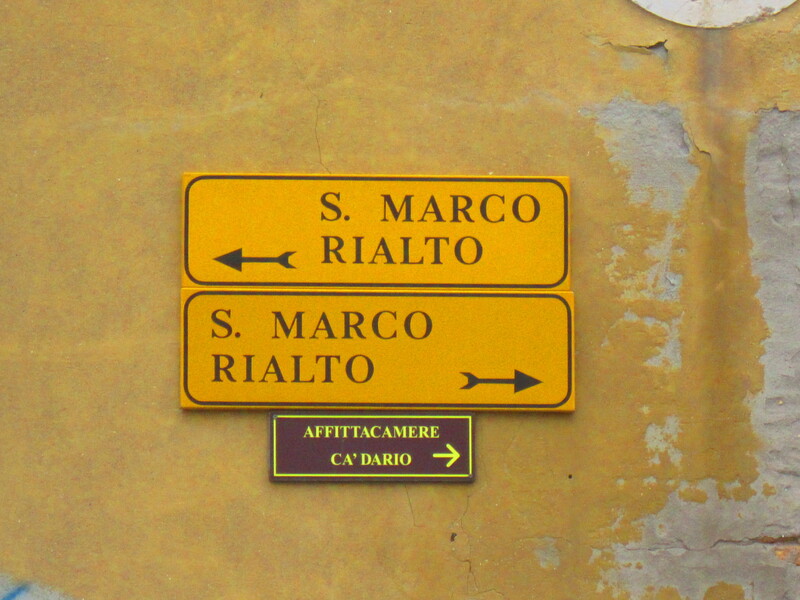 If I went right, it said, I would reach S. Marco Rialto. If I went left, I would reach S. Marco Rialto. We should all be so lucky as to have traveled as much as you. Best wishes on your future journeys.